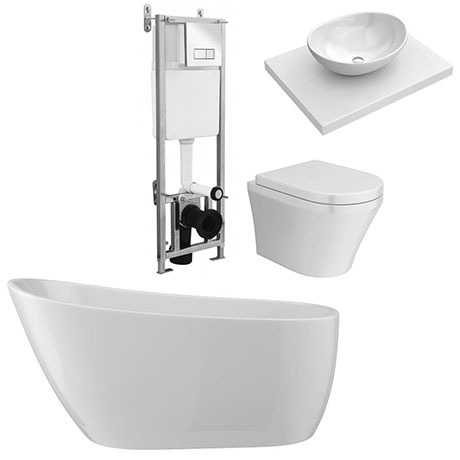 The Luxury Toronto wall hung bathroom suite brings great style to any modern bathroom setting. Without any compromise on style and good looks the wall hung option provides a bathroom design solution delivering a completely clear and open floor area. Features a contemporary free standing slipper bath tub, ideal as a centre piece for any bathroom design. Manufactured from 4-6mm thick smooth white gloss acrylic. This modern minimalist bath tub has been designed for use with wall mounted or floor mounted free standing taps. The stylish wall hung counter top shelf with 410mm wide oval shaped counter top basin is perfect for creating a boutique feel in your bathroom. Inspired by organic shapes the basin comes with no tap holes and is to be used alongside a counter or wall mounted outlet. Shelf is supplied undrilled to allow flexible positioning for your basin and tap. Undrilled - to allow flexible positioning for your basin and tap. The new wall frame is supplied with a stylish square chrome dual flush plate cistern.